You are here: Home > News > Listing Survey Years Behind Schedule. 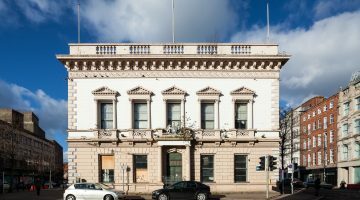 UAHS welcomes the Northern Ireland Audit Office’s acknowledgement that Northern Ireland’s built heritage is ‘an irreplaceable cultural asset’ and ‘a vital and non-renewable component of our economy’ making ‘a significant contribution to a number of outcomes in the draft Programme for Government 2016-2021. The report highlights that the second survey of listed buildings in Northern Ireland remains significantly behind schedule. Read the NIAO report here. The accelerated losses to the built heritage asset, which includes significant numbers of buildings, both not yet listed, and of locally important buildings on the margins of the threshold for listing, emphasises the need for an effective and simple interim protection procedure. As highlighted by the recent demolitions of ‘nearly listed’ buildings at North Street and the proposed loss of the unprotected Boyne Bridge at Sandy Row, UAHS believes that the existing provisions for temporary interim protection are unfit for purpose. In apparent addition to the problem, it seems that some local council planning committees appear to be unable to both appreciate the value of the asset and to realise the adverse effects of cumulative damage to their local and N I built heritage asset resulting from continuing individual losses. These Committees appear reluctant to apply the Building Preservation Notices which formerly were a Departmental instrument thus exposing the public perception of the power of ‘spot listing’ as a myth. The lack of any continuity of funding stream for the built heritage asset remains the root cause of the problems and, given the acknowledged income generating power of the asset it is difficult to understand why the relatively small sums required are not allocated. UAHS will be in touch with the Audit Office to relay our ongoing concerns.